The project has an average of more than 150 workers per night. Started in February 2017, Archer Western Construction LLC is currently in its second year of work on the Florida Department of Transportation's (FDOT) $89.5 million multi-year project to enhance 6.285-mi. of highway (six lanes in each direction) along SR 9A/I-95 from NW 29 Street to NW 131 Street in Miami-Dade County. The project, funded both federally and by the state, is expected to be completed in summer 2020. 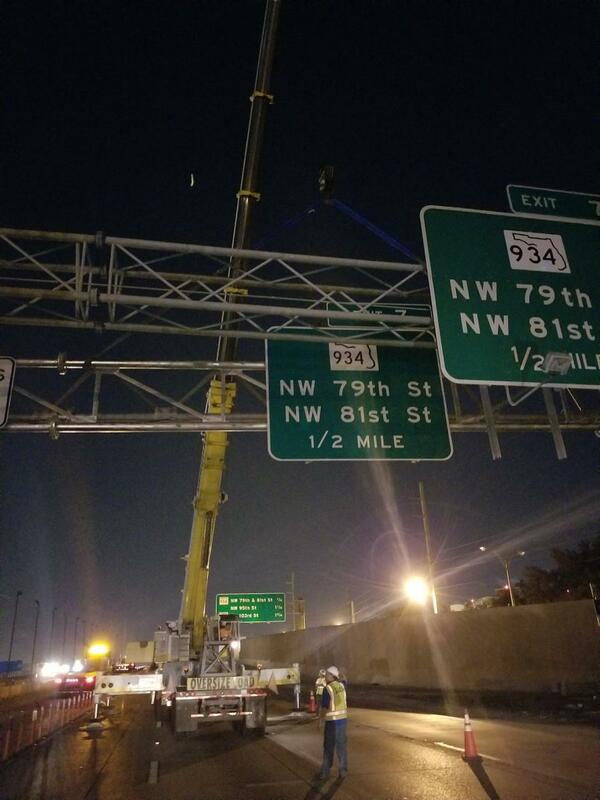 The work will replace the concrete road surface on northbound and southbound SR 9A/I-95 from NW 29 Street to NW 79 Street; rehabilitate bridge joints; enhance drainage along the project corridor; asphalt pave ramps at NW 79 Street and NW 69 Street; install new signage, lighting, lane striping and intelligent transportation systems such as cameras, vehicle sensors and overhead electronic message boards; and construct five emergency stopping sites (ESS) in the median on SR 9A/I-95 between NW 62 Street and NW 131 Street. There will be three ESS sites in the northbound direction and two in the southern direction. The ESS sites are expected to be open late May 2018 and the concrete replacement is expected to be completed in the summer of 2020. I-95 in Miami-Dade County was constructed in 1963 and since then has undergone several widening and pavement rehabilitation projects. The current project has been in the planning stage since 2015. The ESS sites project is part of a series of safety initiatives along I-95 Express Lanes that include installing sturdier, more durable express lane markers that are spaced closer together to reduce lane diving. The department has plans to improve other sections of I-95 over the next five years. On an average day, approximately 254,500 cars and trucks use this section of highway. FDOT provided concept plans in the proposal prepared by Keith and Schnars, and final design for the roadwork was prepared by GAI Consultants, the EOR for the design-build firm. 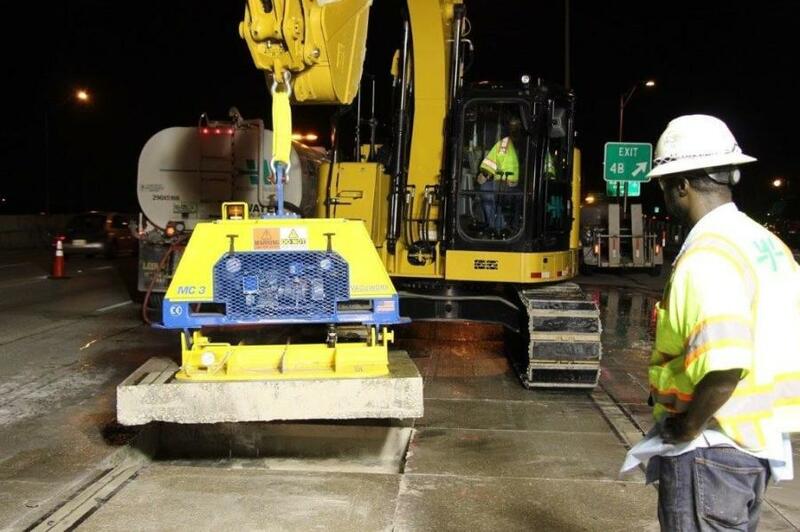 “One of the major challenges is to develop an innovative concrete mix design that will reach minimum compressive strength of 2,200 psi within the allowable lane closure times to not impact morning rush hour commute,” said Mabrouk. 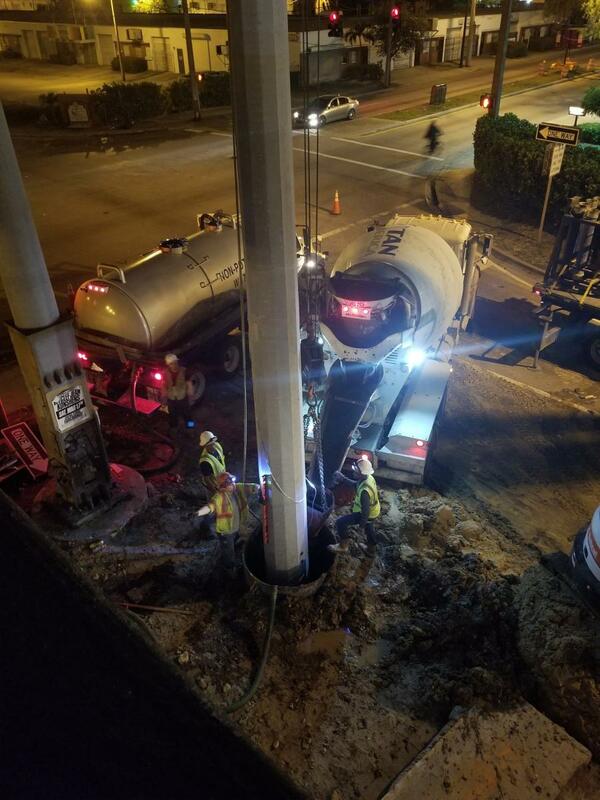 “The existing concrete thickness is approximately 9 inches In order to improve the life span, the new pavement thickness has been increased to 10.5 inches. The design change considers increased usage and heavier loads. The traffic management plan will require traffic shifts and temporary lane closures during non-peak hours at night and during the day with detours as the general contractor performs work along the corridor and ramps. 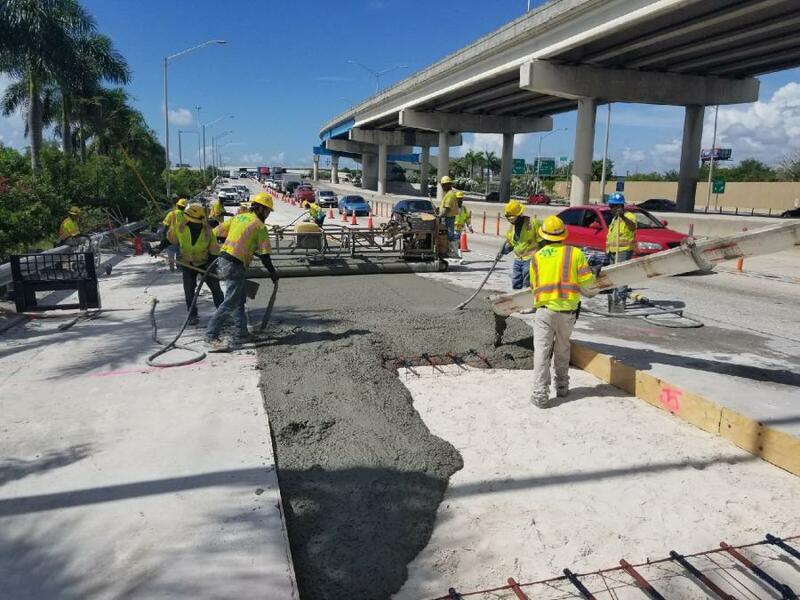 So far, Archer Western has completed pavement replacement on NB I-95 Lane 6 and the removals and drainage on all five of the emergency stopping sites. The goals for the 2018 season are to complete and open the emergency stopping sites, start the bridge work, and complete 75 percent of the NB I-95 paving work. The drainage work took place at the emergency stopping sites. This involved removal of the existing median drainage system and inlets and installation of a new trunk line with median barrier inlets. “Working between two temporary barrier walls with limited space has presented challenges with the drainage installation,” said Fauls. The subcontractors on this project include: Traffic Management Systems, Ranger, Traffic Control Products, Shelby Erectors, Bob's Barricades, Amroad, Vacvision and Badger Daylighting. The work will see the removal and reconstruction of 284,000 sq. yds. 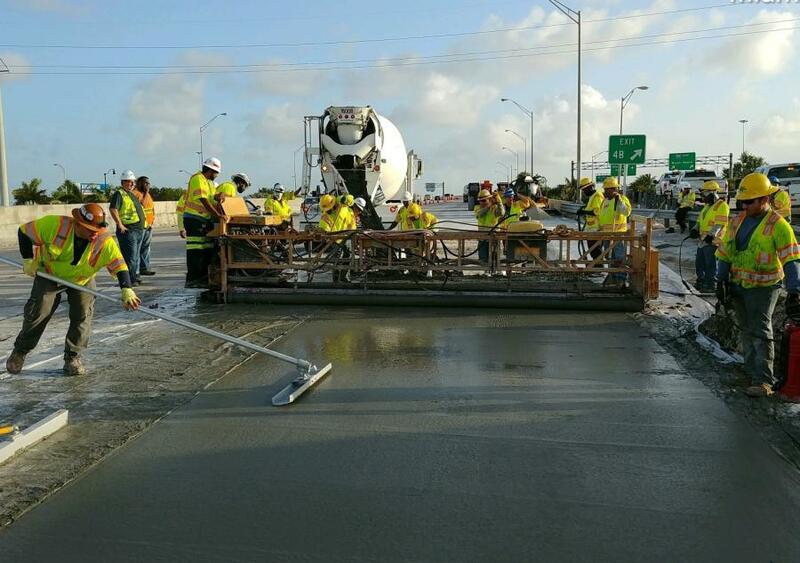 of concrete pavement as well as the sawing and sealing of 408,000 linear ft. of concrete joints. Archer Western is using a Cat 325 and a Cat 315 excavator, Takeuchi mini-excavators, Cat D5 dozers, a Cat 292 skid steer, Volvo L90 and L120 loaders, an Allen triple-tube roller screed, Hamm double-drum rollers, Mack dump trucks and McNeilus concrete mixer trucks. Archer Western purchases and rents equipment from dealerships such as Flagler, Kelly Tractor, United Rentals and Herc Rentals.